If you are searching the market for a new horsebox, the number one question on your list should be asking for the payload and calibrated weight certificate. I cannot emphasize this enough. If the horsebox payload is wrong you may very well go over the allowed maximum authorised mass, making your insurance void, opening you up to prosecution and putting yourself and other road users at risk! It probably comes as no surprise to hear that removing items from overweight horseboxes has become a regular part of our workload. The market is flooded with overweight horseboxes, so much so that I only take our own builds back in part exchange. Unladen weight is the weight of the horsebox when it is not carrying any passengers, goods or other items. It includes the body and all parts normally used with the vehicle when it’s used on a road. It does not include the weight of fuel or water. Maximum authorised mass (MAM) is the weight of the horsebox including the maximum load that can be carried safely when it’s being used on the road. This is also known as gross vehicle weight (GVW) or permissible maximum weight (PMW). It will be listed in the owner’s manual and is normally shown on a plate or sticker fitted to the vehicle. Payload is calculated by removing the unladen weight from maximum authorised mass (MAM). I have been pushing the importance of horsebox payload for more than two decades and with a more informed public leading the charge, weight certificates have become almost commonplace. Unfortunately for customers today ‘weight certificate provided’ has turned into a mostly meaningless sales phrase. That is, unless it is actually accompanied by a payload figure (kg) in the advert. At face value it sounds above board, but in reality the payload is an essential factor for customers to calculate in terms of whether their horses and associated tack will even fit within the maximum authorised mass (MAM) before they ever consider visiting the seller. As an example of how meaningless this phrase can be, an advert for a horsebox stalled for three horses can just state ‘weight certificate provided’. It may be provided, but it may state the payload is only one tonne and this is clearly not enough for three horses! A calibrated weight certificate is really the only way to ensure the horsebox you are buying can legally carry the horses it is stalled for. This information comes with one more word of caution; it is common place for sellers to remove items like rubber mats or horse partitions to ‘cheat’ on the stated payload and when questioned they often claim ignorance. My best advice is take nothing at face value and if you have the slightest doubt whatsoever, weigh the horsebox yourself. When considering the payload you need in a new horsebox, you must have some context to make an informed decision. This is a sensible exercise to show the payload you will require and it is the easiest route to staying safe and legal on the road. It works for any size of horsebox and it means you will be armed with all the facts. Starting with an empty horsebox (unladen) with little fuel, no water, no tack and no horses – weigh the horsebox at your local weighbridge making sure you and any passengers are not in the horsebox or on the weighbridge. This will give you the unladen weight. Next fill the horsebox (laden) with fuel, water, all tack and all the horses you intend to carry and weigh again at your local weighbridge making sure you and any passengers remain in the horsebox. Now you will have figures in kilograms for laden and unladen weight. To do the math, take the unladen weight from the laden weight and this will give you the amount of payload your new horsebox must have as a minimum. You will probably be shocked at the payload you need! For KPH to be as transparent to our customers as possible, I invested in calibrated onsite weighing equipment and offer the option of weighing the horsebox whilst they watch. Many of the issues I see with overweight horseboxes stem from cost, where cheap manufacturing usually equates to heavy horseboxes. 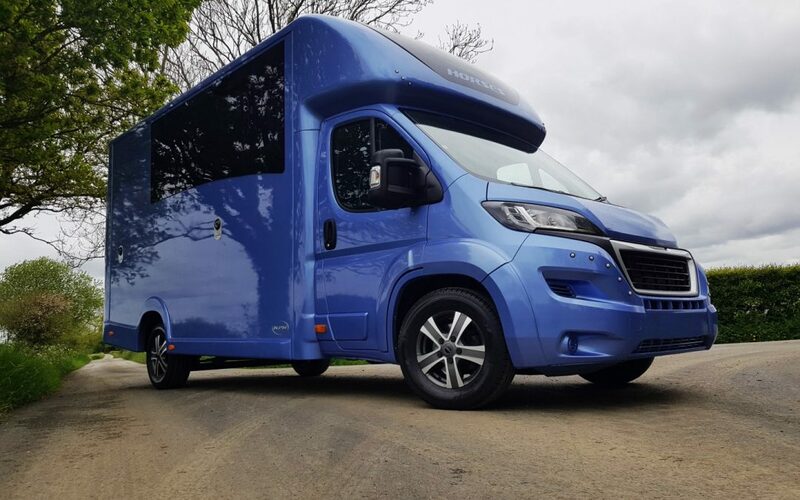 As a manufacturer I know all too well that low weight horseboxes come at a higher cost and that it is only possible to have our large payloads (Aeos 4.5 tonne has 2 tonnes of payload and the Helios has 2.6 tonnes of payload depending on the chassis) by designing our horsebox range from the ground up, around cutting edge materials and processes. Although more expensive, these materials and processes have many benefits for our horseboxes. These include added strength, stiffer construction, reduced vibration, reduced noise, improved appearance, added longevity and much reduced corrosion, to name but a few. It is one reason why few of our horseboxes ever appear for sale as used vehicles and why our customers keep them a very long time indeed. In conclusion the whole horsebox weight issue is complicated for customers and wouldn’t it be of great benefit to the whole horse community if weighing was part of the yearly test!